xThis text is replaced by the Flash movie. first released in Europe in Bulgarian language. December 20th 2006. Dolce Sinfonia supports and attends many charity events to prevent cruelty against animals. Also to raise money for those unfortunate animals at the rescue organizations. Please, visit our Link below to enter our Links Side. The "link" site also contains very important "Facts" about puppymills, backyard breeders, "designer dogs" etc.. ! 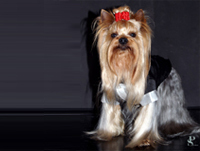 Visit our gallery of some of young Dolce Sinfonia Yorkshire Terrier champions of this 21 century. Our new generation of Superstars and celebrity pet. 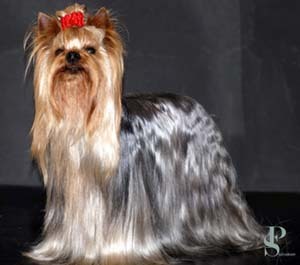 All bred by Dolce Sinfonia Yorkies in Beverly Hills. Click the image below to access our page. Dolce Sinfonia is very proud to present its new amazing champions! It’s hard to imagine a red carpet event without a DS gown. Also Visit our Dolce Model Page. A celebrity pet for celebrity, loving people! 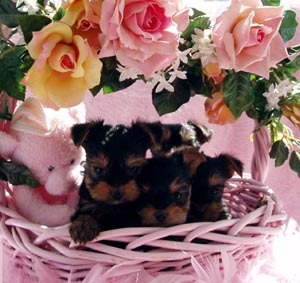 18 years as a writer of articles about the Yorkshire terrier breed, report of shows, tools, suggestions and ideas on how to groom, handle, improve and caring for toy dogs. Author of Sold Out book "Passport Of A Champion" released for the first time in Europe on December 2006. 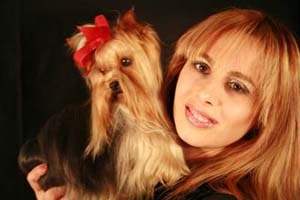 And...also the Brand name with the finest products for glam dogs and their glam owners. Our Dolce Sinfonia babies are raised with love and pampered to the extreme. 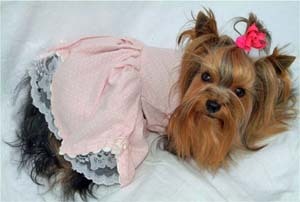 Dolce Sinfonia pampered Yorkies are only available to exclusive and loving homes. I will never be associated with puppy mills or promote back yard breeders. I will never promote those individuals that interbreed different type of breeds. I am completely against those individuals that sells their animals true pet stores and brokers/dealers. I do not sell ONLY to "the rich and famous". I promote "responsible breeders and responsible owners". 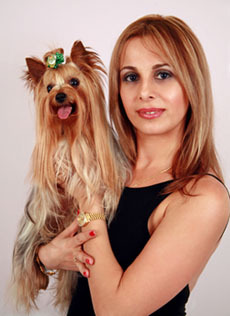 However, my Yorkies are not accessories. I will only sell to those responsible individuals that will love, care and spoil my babies the way I do. Please, do not feel offended by compiling my form. I only do that to protect my Yorkies and to make sure my Yorkies will never end at the pound or at any shelter and will never be mistreated. I also welcome any suggestions and ideas.